* 20% off Ski and Snowboard Packs when you book a holiday in Hotels Bansko, Pirin or Mura in the Bulgarian Ski Resort of Bansko. * Free Ski Services. When you pre-book ski services for 2 Adults, one child will get the same services free. Excludes Ski Carriage. * Free Ski School. When both parents book a Full or Learn to Ski Pack. The main ski holiday destinations for Balkan Holidays are the Bulgarian winter snowsport resorts. The most modern and popular of these resorts is Bansko, set in the Pirin Mountains, Bankso has recently just hosted the Mens Apline World Cup. Unique in that it is a modern resort with fantastic facilities, and has an old town where you can experience traditional Bulgarian hospitality. Borovets is the oldest and most establised of the Bulgarian Ski Resorts, a short transfer from Sofia Airport will bring you to this lively and popular resort set in the Rila mountains. Many hotels are conveniently located close to the nursery slopes and bottom station of the gondola lift. Pamporovo is nestled in the beautiful Rhodope Mountains, an excellent choice for beginners and families. 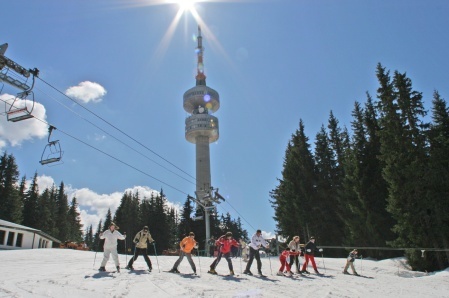 The renowned Pamporovo Ski School has introduced many beginners to their first steps on the snow.